Gobo, or burdock root is a perennial plant and is long and slender, growing anywhere from one to three feet in length. Its coarse, thin skin is typically covered in dirt. Once scrubbed clean, it is a rusty beige color with an appearance similar to a brown carrot; its flesh, a crisp off-white contrast. The root is sweet, mild and earthy with a taste similar to artichoke; some say the flavor can be slightly astringent. 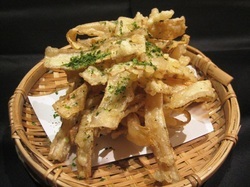 It is a very common vegetable used in everyday Japanese home cooking - boiled, stir fried, deep fried, stewed, baked, braised as well as taken in form of a gobo tea to enjoy the full benefits of it's nutritional value. 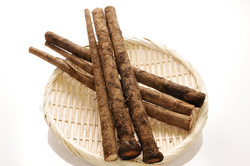 Burdock root is typically available year-round. The new gobo comes out around June/July which is whiter in color and smaller. Burdock roots are known to carry numerous compounds that are known to have been anti-oxidant, disease preventing, and health promoting properties. The root is very low in calories; provide about 72 calories per 100 g. Burdock is a good source of non-starch polysaccharides such as inulin and cellulose, a dietary fiber that help act as a laxative. Additionally, inulin acts as prebiotic and helps reduce blood-sugar level, body-weight, and cholesterol levels in the blood. Burdock root is especially containing good amounts of electrolyte potassium (308 mg or 6.5% of daily-required levels per 100 g root) and low in sodium. Potassium is an important component of cell and body fluids that helps control heart rate and blood pressure. This herb root contains small quantities of many vital vitamins, including folic acid, riboflavin, pyridoxine, niacin, vitamin-E, and vitamin-C that is essential for optimum health. Both vitamin C and E are powerful natural antioxidants help the human body stave off infections, cancer and neurologic conditions. Furthermore, it also contains some valuable minerals such as iron, manganese, magnesium. The skin has the most fragrance and umami (The skin contains 55% more glutamic acid than the flesh), so it is preferable that it is just scrubbed off with a brush, or scraped off by using the back side of a knife and not to completely peel it off. Wrap it in newspaper with the dirt on and store in a dark cool place for up to 2 weeks. Store washed gobo in the refrigerator and consume ASAP. Wash the gobo and slice it thinly using a peeler. Deep fry the dusted gobo in medium heat (170C) until crisp. Sprinkle salt and aonori (green nori seaweed flakes).